Sony's SXRD reflective technology in native 4096x2160 resolution. TRILUMINOS color gamut with broader color range, reproducing more tones and textures than Rec709. Powered 2.1x zoom and focus lens and powered vertical/horizontal lens shift. 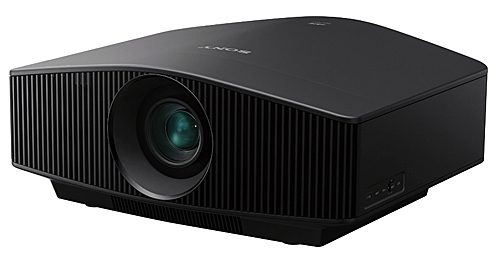 Sony VPL-VW285ES ($4,999): The VW285ES drops the price of 4K projectors featuring chipsets with full native 4K resolution on the chips to under $5,000 for the first time. The VW285ES is built to deliver an immersive extremely high resolution 4K cinematic and gaming experience. It is rated at 1500 lumens and carries no published contrast rating. The light source is an ultra high pressure lamp with an estimated life of 6000 hours. Sony VLP-VW385ES ($7,999): The mid-level VW385ES is a contrast enhanced version of the VW285ES, carrying a dynamic contrast rating of 200,000:1. It also adds two other key features: (1) Picture Position memory (automatic one-touch lens readjustment to accommodate different aspect ratios for Cinemascope constant-image-height installations), and (2) Built-in Auto Calibration to maintain color balance over time. Like the VW285ES, this model has an ultra high pressure lamp with an estimated life of 6000 hours. Sony VPL-VW885ES ($24,999): The VW885ES replaces the high pressure lamps with a 20,000 hour laser illumination system. Dynamic Contrast is increased to "infinite" using real-time laser light level control. Brightness is boosted from 1500 to 2000 lumens. The VW885ES is a larger and heavier projector, weighing 44 lbs. compared to 31 lbs for the 285 and 385. It has a different cooling system with airflow exhausting out the rear of the unit to eliminate any possibility of heat exhaust affecting projected light. The VW885ES also introduces Motionflow (frame interpolation) for 4K signals, and it supports 18 Gbps on both HDMI/HDCP 2.2 inputs. It also adds a 4K vertical stretch mode for Anamorphic lens compatibility. Like the VW385ES it offers Picture Position memory and Built-in Auto color calibration. Great scoop to have the USA model #s, SRP and features! This is one of my most important reasons to attend CEDIA this year. I spent 2 hours in the upstairs Pavilion at cedia in this Sony projector shootout and was very disappointed in the way Sony chose Which models to compare their projectors to and the way they appeared to stage the Sony product versus the competition. The presentation appeared to be unrealistic and skewed towards Sony especially as they compared their laser projector for $20,000 to the JVC laser for $30,000. That was easy to notice the Sony video profiles had been pushed to make the Sony appear to be as bright as the 3000 lumens JVC as the Sony picture appeared to be washed out with untrue colors all in an attempt to increase its lumens sacrificing contrast and picture quality. It was also notable to notice that Sony as they demoed their new entry-level model comparing it only to the Optima 60 and for going any comparison to any of them or competitive models from JVC or other manufacturers. The Sony director who did the presentation appeared to be more of a video Hit Man than an unbiased referee or presenter. Waba 4K Sony projectors do deliver a very sharp 4K picture there were many things that I expected to see that we're missing including 3D performance. 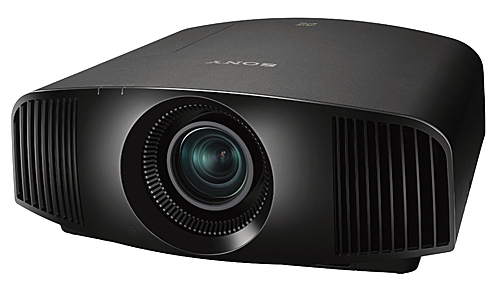 I also found it even more remarkable that Sony refuses to publish it's native contrast ratios on any of the new projectors and even on its new 385 mid-level projector publishes only a contrast ratio of 200,000 in the dynamic mode. I agree - the Sony demo was totally staged. Better wait for some trusted reviews and actual calibrated measurements. The VW885 will be great, but on smaller screens than the RS4500, which is brighter. Craig and Billy ... having seen dozens of vendor-staged competitive shootouts over the years, this Sony demo was nothing new. The vendor in control of the demo always sets them up to highlight their best advantages, as one would expect. Quite often the vendors who stage competitive side by side demos are drawing attention to performance characteristics in which they do in fact have an advantage. Sometimes they don't. Invariably these demos are interesting and worthwhile, but it is up to independent reviewers and the buying public to put the claims made by the vendors into proper context. If the venders were using the same methed of measuring the brightness, how much brighter would an 3,000 lumens projector appear to your eyes Vs the 2,000 lumens projector? Also if I understood the statement correctly, did Sony drop 3D projection on all 3 of their new models? VW285, VW385 and VW885. Anthony ... the fact is 3000 lumens does not look much brighter than 2000. The difference is more in the black levels when viewed in the dark rather than the brightness of the image in ambient light. Regarding 3D, there was no mention of 3D in Sony's release, but ALL new models have 3D. What these Epson vs Sony or JVC articles never seem to note is reliability. Specs and picture/price doesn't matter at all if its not working. I sold Epson almost exclusively for 2.5 years and now have sold Sony for over 5. Epson projectors had a very high failure rate. To this day we probably had 3x as many bad Epson's in half the time as we have Sony. If fact there are only 3 Sony projectors I can recall having issues.